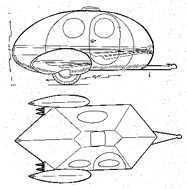 The 'Roswell' is probably a mythical trailer, but these sketches, that are all that seems to exist for it, have interested people for many years. 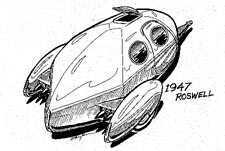 So the time has come to produce a set of drawings of the Roswell and see if any of the many people who've said they would like to build it actually do so! The Roswell body has been drawn at 132" (11') long by 60" wide and 56" high. In teardrop terms, that sounds spacious, but the body shape means there is little volume to the body. The result is that if can contain a decent double bed and some lockers, but that's all. Including a (triangular!) galley at the rear would be possible if the bed was moved forwards, but building a hatch to access it would be a nightmare - the only feasible method looks like to build the complete body without a hatch, fit internal reinforcement and then cut out the hatch. The curved hexagon shape of the Roswell is prefectly buildable in ply that's thin enough to curve around the radiuses. 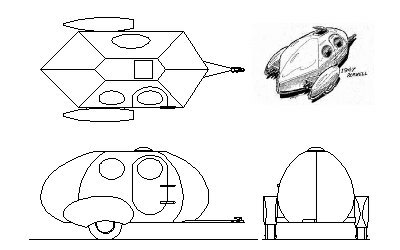 However building a framework and then panelling it, as for a normal teardrop, is a non-starter as the complexity of the framework would be frightening. The practical approach is to build it like a modern ply boat, cutting out the panels to the right shape at the start and then joining them. This is generally called the 'stitch and tape' method and a Google search on that term should produce some description sof how to do this. - Building the curved door. Well, making the door isn't hard, but building a door frame that will seal and yet allow the door to open isn't easy. The drawings contain one method that should work, but it would be necessary to build a jig on which a door frame and a door opening frame can be laminated. 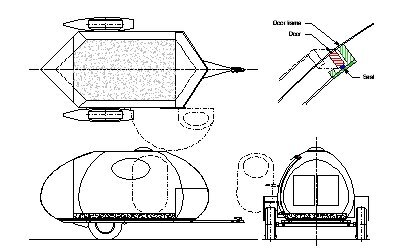 - Building the compound curvature fenders shown in the sketches. This is just too much work for a one-off, so rectangular section fenders have been substituted - these curve in both profile and plan views, but are only single curvature. Both sides are identical, so making a simple building jig is practical. Another alternative treatment of the fenders is included, where the fenders are the same shape as the main body. The PDF has all panels drawn out at 1:12 scale, so it would be possible to print out the panels and build a 1:12 scale model to see the shape and to test the accuracy of the panel drawings. These files have been updated on 01-May-06 to correct an error in the panel expansion drawings in the original files.